This is the first time I’ve ever asked ANYONE to write a guest post for my blog. April has such an incredible, powerful, moving story about how giving the control over to God can save you. NO circumstance, NO struggle, and NO insecurity is too big for God to handle. EVERY girl needs to read this. 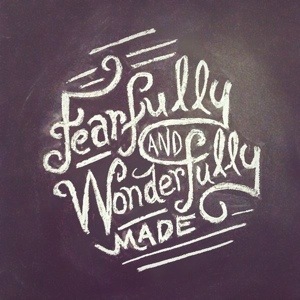 Praising God because you are “fearfully and wonderfully made” is easier said than done, to say the least. I’ve heard this verse multiple times growing up. I thought my youth leaders in the church were trying to instill a group of teenagers to take it for what it was and say, “YES, I am beautiful, loved, and adored by my heavenly father, I will be sure live my life as if I am His beautiful daughter.” This devotion didn’t sit well with me, being a seventh grader and having the self-worth of a turtle. I was the girl who wanted it ALL. I wanted to be the perfect Christian, always say the right thing, and look like a princess while balancing it all. I was determined to fix anything I deemed wrong with myself, from my personality to my waistline. Middle school will heighten any pre-adolescent’s insecurity and I was not exempt from this life lesson. I hadn’t any idea my low-self esteem would end up drastically changing my life as a 21-year-old daughter of the King. I went from not liking the image staring back at me, pulling at my skin, and constantly researching diets & healthful eating as a seventh grader, to going to spin classes twice a day, restricting my meals, purging what I did eat, and avoiding the life God had set before for me. I always knew what I was doing with my body wasn’t considered normal, but I never knew how to rid myself from this disease. I would tell myself that “God is going to heal me in His timing,” and yes that got me through the darkest days of my depression, but God was waiting on ME to pursue Him. I was expecting God to work through me in ministry, but He wanted to work in my heart foremost. I would never be able to live for His glory, until I fully gave my mind, spirit, and BODY over to Him. I prayed for what seemed like years for my eating disorder to disappear from my life, but that was not what God had planned; God was waiting on me to act accordingly. This past January, I attended an enormous conference called Passion in Atlanta, GA joining with millions of college age students to proclaim Christ in this world. Frankly, I was so deep in my eating disorder that I had no desire to go. I would have much rather locked myself in my room exercising and purging then to even leave the house. My dear friend and fellow sister in Christ, Kelly, prayed for me and urged me to get on the crowded bus and travel north. Little did I know, God had big changes for me in Atlanta. He broke my heart into pieces in the greatest possible way a heart can be broken. He allowed me to feel His spirit again and He showed me the life He wanted me to live. On the fourth day of my Passion adventure, God had me calling Eating Disorder Specialists from the Westin and seeking the help I truly needed but never fully accepted. Not even five days later, I was in a psychiatric hospital for eating disorders and praying my way through what has thus far, been the greatest obstacle in my life. Today marks the 50th day of my recovery and I am overwhelmed by the goodness, grace, and forgiveness that God has poured over my life. I never thought I would be able to go even a day without exercising, restricting, and purging, but God has shown me that He is bigger than ALL of that. He is bigger than your anxiety, pride, sexual impurity, anger, depression, cutting, eating disorder, and your negative thoughts. God is working miracles everyday in my life and it sustains my heart more than my fear and anxiety about my body ever did. This week is National Eating Disorder Awareness Week. Our generation is shining a light on Eating Disorders and bringing awareness to all. Everybody Knows Somebody affected by an eating disorder- whether it’s a friend, partner, family member or you’ve suffered. People don’t choose to get an eating disorder, but you can choose to get help. Recovery is possible. This week is National Eating Disorders Awareness week: Go to http://www.nationaleatingdisorders.org or call 1-800-931-2237 to find help and information. If you’re worried about an eating disorder, talk to someone you care about and reach out for help. You are loved, and I promise you, recovery is possible! If God is speaking to your heart about any addiction you are struggling with, I challenge you to step out in faith today by seeking help. His kingdom will be known by your testimony and God WILL use you! God challenged me to take His hand as He guided me through recovery. I am asking the same of you. He wants you to give ALL that you have to Him, including the deepest darkest parts of you. He made that part of you and His love doesn’t stop outside of the crevices of your heart. I urge you to seek God today; He is already seeking you. Powerful post. Thank you for sharing.